Why choose a fire rated loft hatch and ladder? 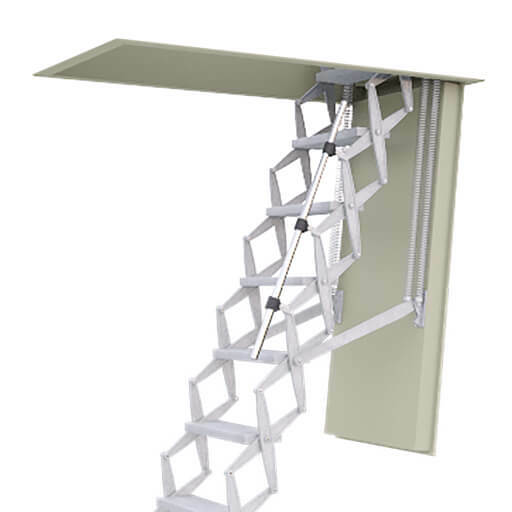 Our product range includes fire rated retractable aluminium and folding wooden loft ladders. These lead the field in design, technology, energy efficiency and quality. All of which are built to EN 14975 and fire resistant to DIN 4102. Also, we have recently launched a range of metal-folding loft ladders. These include one rated to 120 minutes. Another also comes with passivhaus certification and 30 minutes fire rating. These models are tested to ÖNORM 3860, EN 1634-1, EN1363-1. 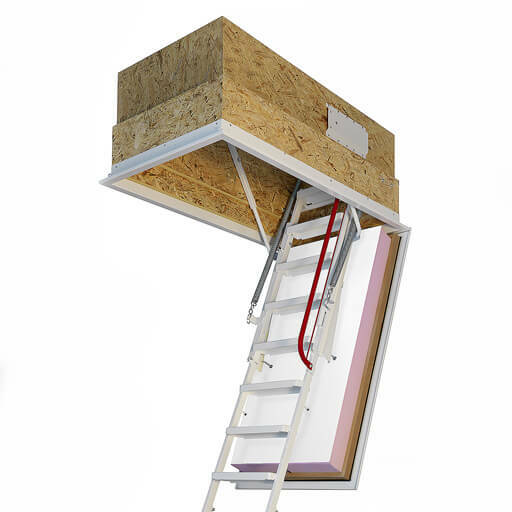 Supreme fire rated loft hatch and ladder, with a steel hatch box rated to either 30, 60 or 90 minutes. Heavy duty fire rated loft hatch and ladders are available for commercial and industrial projects. 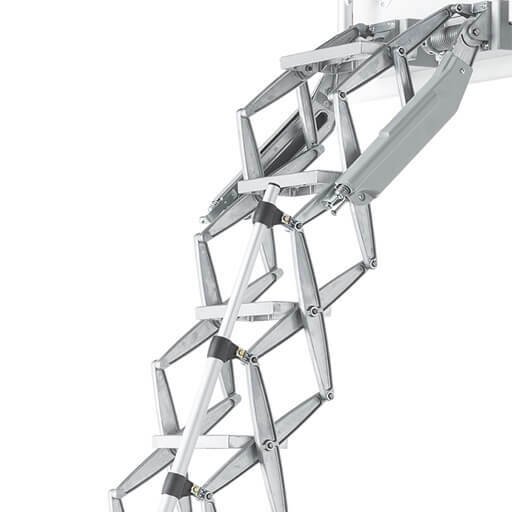 It is important to ensure that the loft ladder has been built and tested in accordance with EN 14975, as a result you can be certain it can support a minimum load of 150 kg per tread/step. However, for commercial projects it is generally recommended to choose a loft ladder certified to at least 200 kg per tread. Also, aim to maximise tread width and depth by opting for a wide ceiling opening. This will improve safety and comfort for those using the loft ladder. Supreme Electric loft ladder with steel fire rated hatch. Ideal for demanding projects such as hospitals. Aluminium, wooden or steel ladder? The choice between an aluminium, wooden or steel fire rated loft ladder is largely based upon preference. 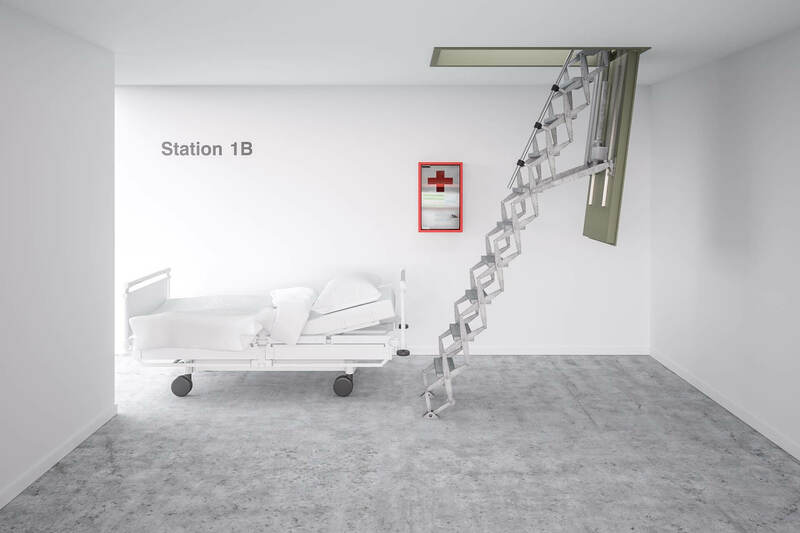 However, retractable aluminium loft ladders are available to fit smaller hatch box sizes. This makes them best suited for projects where space is limited. Also, wooden loft ladders are typically limited to floor-to-ceiling heights of just over 3m. Whereas, retractable ladders, such as the Supreme F30 and F60/F90 with steel hatch box, can be used for heights up to 4.6m. Fire rated loft ladders should be installed following the manufacturer’s recommended guidelines. The process will normally be the same as for any other loft ladder. However, after installing it is essential to fill the gap between the hatch box and the structural opening with a fire resistant mortar. We recommend using a mortar that meets class 3 DIN 18580. Alternatively, you could also use mortars tested to EN 1366-3 and BS 476 part 4 and 20. We also advise that the mortar is filled to a minimum depth of 180 mm within the gap. As mentioned before, thermal insulation can help to keep in the warmth and lower energy use. We recommend choosing a fire rated loft hatch and ladder that offers good levels of thermal insulation. For example, you should really be looking for a product offering a U-value of less than 1 W/m2K. 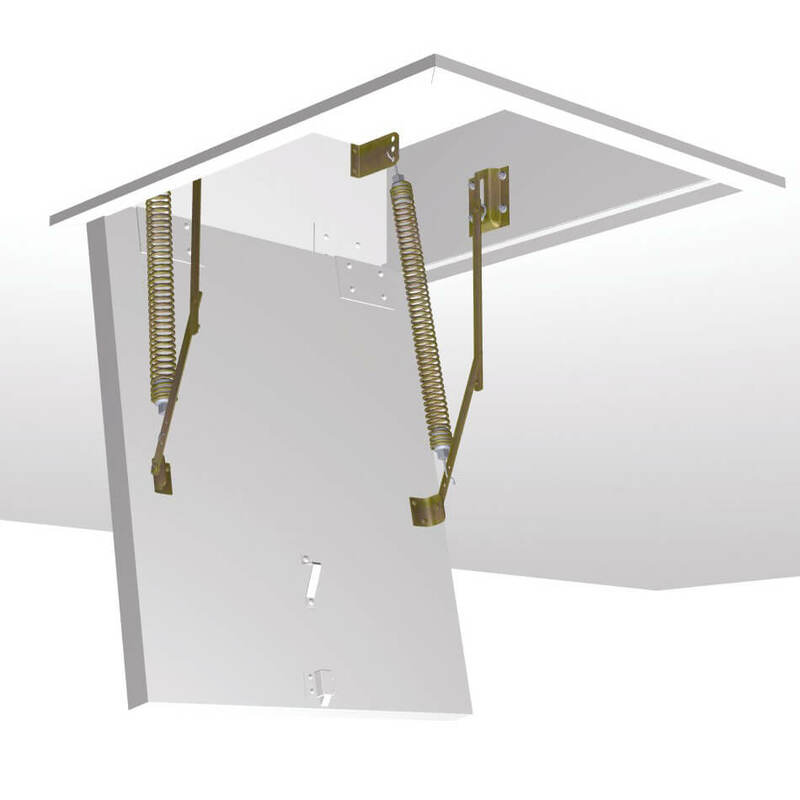 Read our guide to insulated loft ladders for more details. Where security is a concern, such as in public buildings, make sure to choose a loft ladder that can be fitted with a lock. Also, ensure that the hatch is strong and durable. A fire rated steel hatch and ladder may therefore prove to be the best option. Finally, when choosing a fire rated loft hatch and ladder you may wish to consider whether you need a made-to-measure solution. Fire rated loft ladders can come in standard sizes. As a result, they may be available from stock or benefit from a shorter lead time. However, if your ceiling structure cannot be altered then choose a made-to-measure fire rated loft hatch with ladder. Consequently, it may be slightly more expensive and you may have to wait a couple of weeks, but it should save time and cost on-site. The Klimatec 160 is perfect for passive house projects that require fire protection. There is a growing trend to make buildings more energy efficient. As a result, more homes and commercial buildings are being built to passive standards. However, safety and protection from fire also remain a concern. Therefore new products, such as the Klimatec 160, have been introduced to help fill this need. 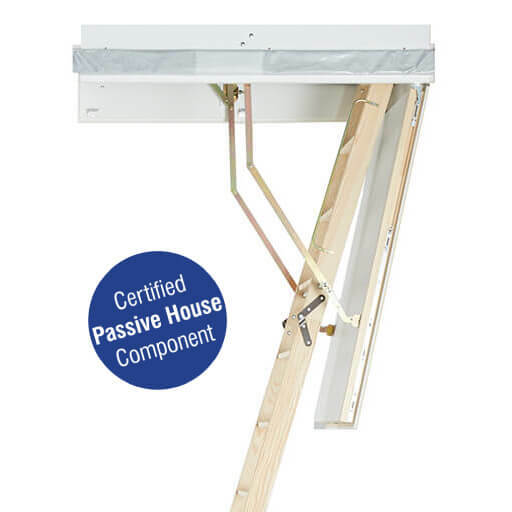 The Klimatec 160 is certified by the Passivhaus Institute. It also benefits from 30 minutes (EI230) fire rating.